To create my rainbow feature I cut a piece of printer paper to the size I was needing and then cut it in half, down the middle. I then proceeded to cover each side with 1/2 inch strips of the fun patterned papers from the collection. I started with my orange strip which I could line up on both sides by running it from corner to corner on my piece of printer paper. After that, all the other strips just fell into place. When I was done I trimmed off the excess and taped them back together on the back, stitching them with coordinating colors of thread. I have a confession... I am addicted to Doodle Pops! I sort of hoard them, but I decided it was time to use them and I love how this darling vase looks paired with a darling bumblebee sticker from the icon sticker sheet. To give my little bee some dimension, I cut off his antennas, popped up his body with foam tape and then slid the antennas back under his body, adding some fun sprinkles as an accent. I am also loving the versatility of the new paper frills--I know I am going to get so much use from them and with their new style, I can see myself mixing and matching them with other Doodlebug collections as well! To finish off my layout I added 3 little flower sprinkles topped with more sprinkles for their centers. Aren't they fun? Make sure to keep checking back for lots more inspiration from this adorable collection! I know you are going to fall head over heals with it! This is beautiful Mendi!!! The stitching is fabulous! Mendi your stitching is amazing, your pic beautiful, I love your LOs!!!! BEAUTIFUL photos and ADORABLE layout Mendi!!! LOVE IT ALL, from your title & journaling to your SUPER CUTE bee, PRETTY papers & stitching - WOW!!! OMG What a beautiful, Beautiful Layout....I am in total awe of what you created...WOW!! First off your pictures are darling and what a cutie patootie she is...I love your journaling *tears* just so sweet....The papers you chose are so pretty and love so love how you stitched them I've just began stitching too on my lo as of last year.....I have to say you did one outstanding creative job....you truly are one super talented scrapper and do scrap with passion thanks for sharing your awesome ideas and all the inspiration that came with. 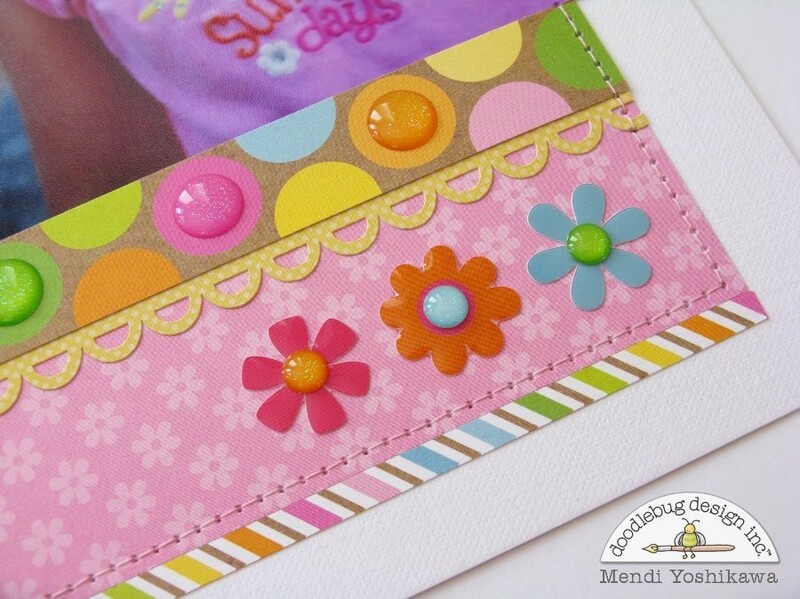 Such a sweet layout, Mendi! Love the stitching too! Fabulous as always Mendi! I just can't get over how perfect your stitching is!! Love it! So cute and cheery, LOVE it! Oh my!!! How I seriously gushed over this at Mendi's blog - she is amazing and one thing she is very good at is making me want to have at least 2 or 3 of everything Doodlebug makes!! So fun and ultra amazing - this layout made me smile and made my heart happy and light!! Thank you, Mendi, for sharing your talents and Doodlebug, thank you for the awesome and way incredible products!!! 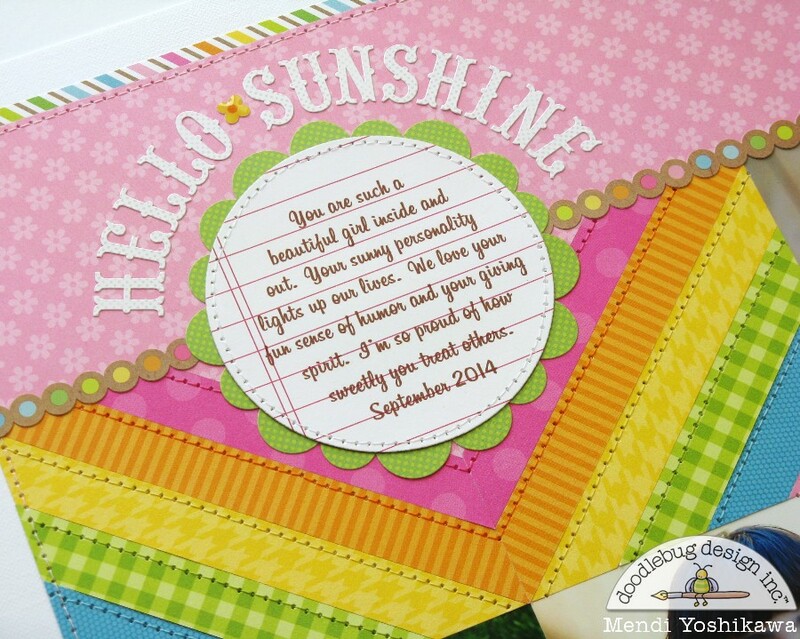 Hello Sunshine Projects Brighting Our Day! !